Caution: these are almost as addictive as my chocolate cream caramel bars. This is the THIRD TIME I have made them because they are so damn delicious. Please, make them. Share them. 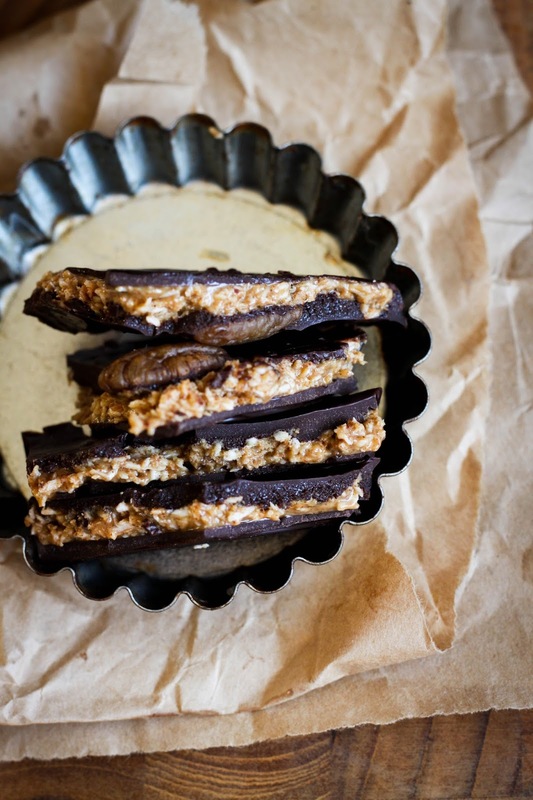 Rejoice in the miracle that is raw vegan chocolate + almond butter + coconut. 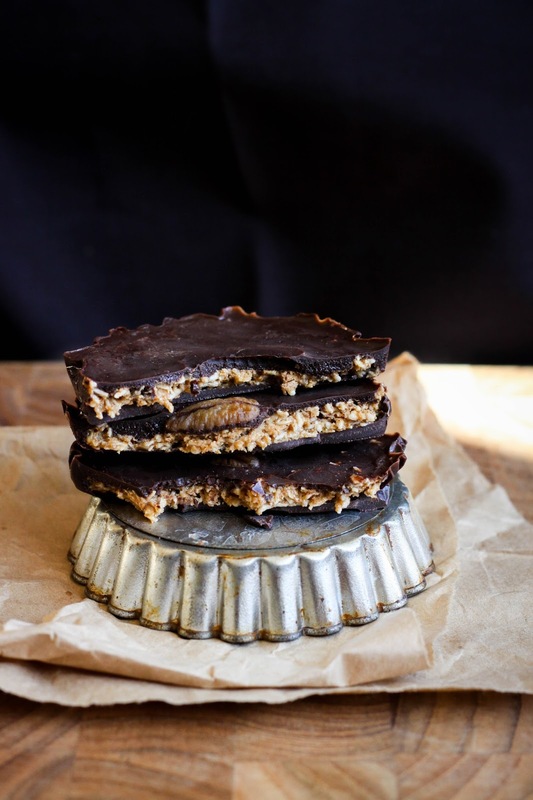 Essentially what you have here is a super wide peanut butter cup with raw chocolate, but I use almond butter instead of peanut butter, and I mixed in coconut shreds to thicken it up. By the way, I found the best shredded coconut! It's from a really neat little company right beside me (on Vancouver Island) called Harmonic Arts. They have the most amazing tea blends too, and many of their products are wild-harvested. Everything is organic. 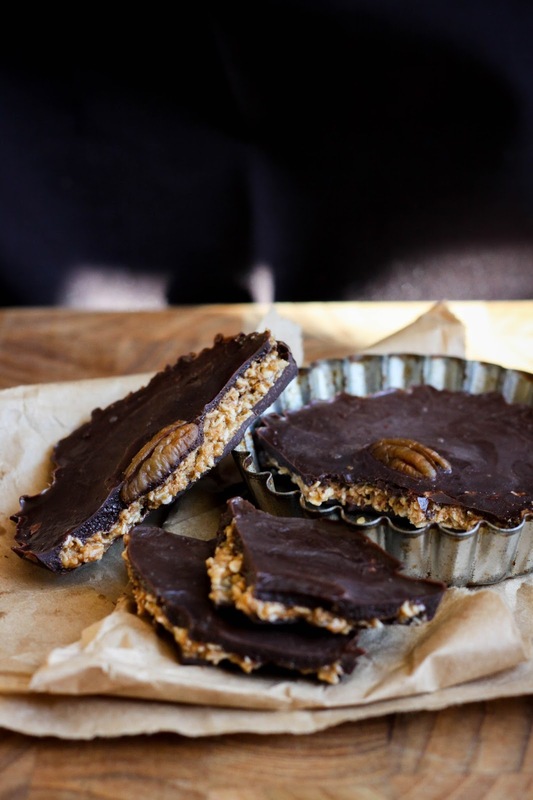 The idea for these chocolate almond butter cups came my lover, Jack. He suggested I use my mini tart tins to make peanut butter cups with. We didn't have peanut butter, and I love almond butter more anyway, so I used that. Holy HOLY. We couldn't get over the magic and quickly proceeded to inhale one a piece. Then I had to make more. So I did a few days ago at his place, and left them in the freezer overnight. EVEN BETTER. Then I realized... hey, why am I not sharing this with all my favourite people (i.e. you guys)? So I made 'em yet another time just to take photos. These are not my best pics ever, by a long shot, but they get the point across. That point being: this recipe is a life/game changer. Perfect for any human, but especially the ones who don't think eating plants is the best thing ever (in other words, those who are skeptical of veganism). As plant-lovers, I think it is our responsibility to share our delicious grub with the world in order to prove the stereotypes wrong. We don't munch on carrot sticks and lettuce while we cry about being deprived (although I cannot speak for all vegans here). We actually can be some of the healthiest, happiest, SEXIEST - ya know I am lookin' at you - and most emotionally-grounded folks around. Inspire and lead by example! That is my philosophy. Certainly there are other methods out there to sharing the plant-based message, but I prefer to just get excited about healthy, cruelty-free food and share it with others whenever they are open to it. I don't preach (or at least I try not to), and I don't guilt trip people if they eat McDonald's! I give them a chocolate coconut almond butter cup and dance around while subtly letting them know I am this happy mostly because I eat a lot of plants and love animals. It doesn't have to be a negative experience. I think support, encouragement and baby steps are the best way to go when it comes to helping people change their minds about their diet and lifestyle. 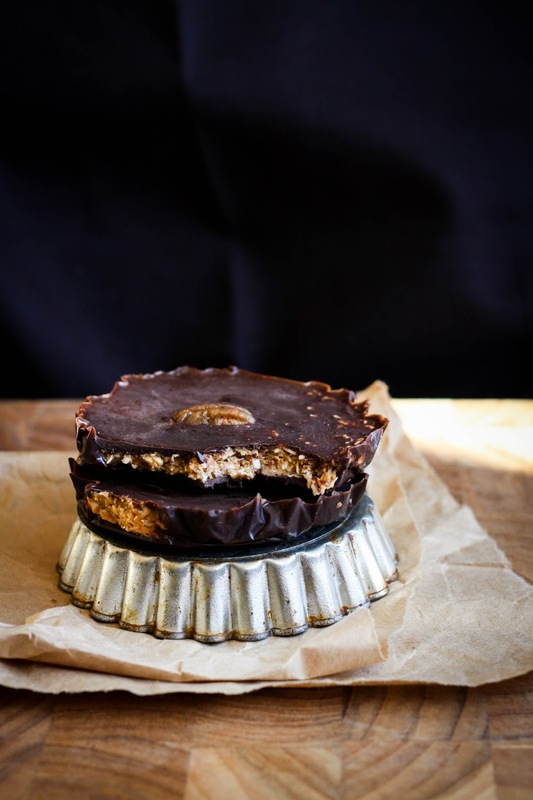 CHOCOLATE COCONUT ALMOND BUTTER CUPS FOR EVERYBODY! Makes two huge cups, or a few smaller ones. 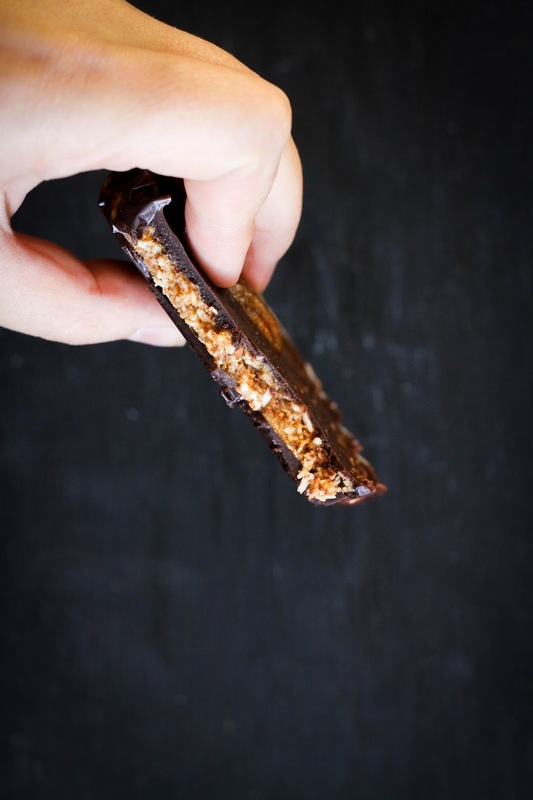 To make the coconut almond butter filling: simply stir everything together! Prepare two mini tart tins by lining them with plastic wrap, or use cup cake papers. Pour half the chocolate mixture evenly into the bottom of the tins or papers, then put in the freezer until solid (it should only take a few minutes). Scoop the almond butter mixture evenly into each tart tin or paper, then cover with the remaining half of the chocolate - decorating with a nut if you like - and put in the freezer for another few minutes til solid, or leave 'em in overnight for a frozen treat. Wuju!! So simple and it looks super yummy : ) i will have to buy that mini tart tins though. oh baby indeed!! these cups look fabulous! The second I saw these (in my email/inbox) all I could think was... give me the recipe now!!! :) Cannot wait to try these! Greetings from Turku, Finland, Scandinavia! Thank you so much for your wonderful recepies. I can't tell you how helpfull your blog is in our family. My nephew got astma on his second year, horrible winter of ER visits, adrenaline shots to keep him alive... U till in May they realized it's milk and egg allergy. Diet change really has made him so much better and life easier. So- your wonderful vegan recepies have turned out a huge source of joy, as we all need the good treats. As active aunt I'm just rejoycing all this good stuff I can make my bro's children (as of course they eat all the same) and teach them the joys of vegan life a treat at a time... Thank you so much and loads of inspiration! Yay chocolate coconut almond butter cups for me! I think handing out vegan food is the best way to support our cause! @Anonymous - no no go ahead and gift them, I like them cold but they will be ok as long as they aren't in a warm place too long (coconut oil melts at a little warmer than room temperature).